Challahs these days are a changin’: they are topped with sprinkles, stuffed with pastrami or flavored with gourmet seasonal ingredients like ramps. They are unique. And while they all hold firm to their traditional braided bread roots, they are definitely a new breed of bread, not braided cake. So to make bread that is cake but still challah, I had to do my research. 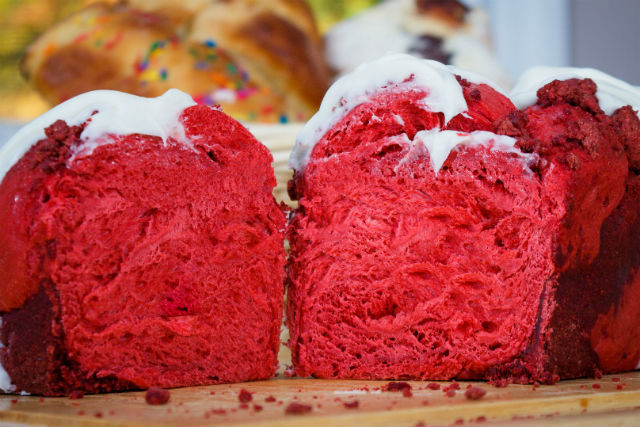 I looked at countless recipes…everything was red food coloring, cocoa powder, buttermilk, vanilla…all things that go great in a CAKE but, in challah dough? Not gonna work. So what do you do when you are a mommy on a mission but can’t figure out how to get your project to the finish line? You cheat. Turns out Amazon sells bakery emulsions, which are concentrated flavor for baking that add depth without requiring excess liquid. They come in every flavor under the sun, including Red Velvet Cake. One click and two days later I had the bottle in my hands. I carefully opened it, and holy mother of cake balls, it smelled fantastic. Like cake in a bottle. Aside from adding the emulsion, I made two changes to my basic challah recipe: I removed the eggs, figuring all those yolks might affect the good red color, then replaced them with an additional tablespoon of oil and water; I also added 2 tablespoons of vanilla sugar to keep the dough’s consistency in check but add a hint of vanilla. 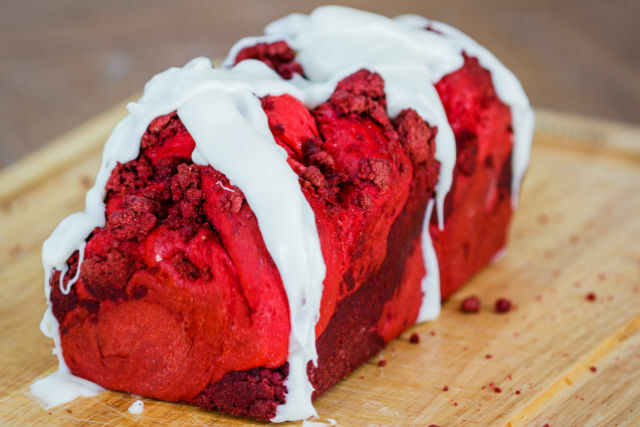 I didn’t want to make the challah too cakey, though I did want to kick it up a notch in terms of its red velvet cake flavor. 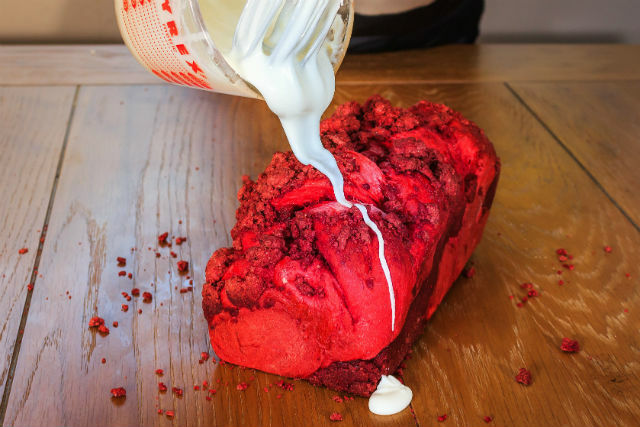 It turns out Duncan Hines makes red velvet cake mix. A little margarine, a little vanilla, a little cake mix and voila! An actual red velvet cake crumb topping. Add a simple glaze to the top because glaze is awesome and, believe it or not, you have a red velvet cake that is a challah. It looked and tasted amazing, but most amazing of all was my little girl’s face when she saw her special birthday challah. All the work and planning was totally worth it…until my son requested a Jello Challah for his birthday. Add dry and wet ingredients to a bread machine in the order specified by the manufacturer. Set machine for “dough” cycle. If not using a bread machine, combine all the ingredients in a large bowl, turn out on to a floured board and knead for 5 minutes. Allow to rise in a large bowl covered with plastic wrap or a towel for 1 1/2 hours. While dough is rising in the bread machine, prepare the crumb topping by combining ingredients with a fork until well blended (mixture will be crumbly). When dough cycle is complete, remove dough from bread machine and divide into 6 equal portions. Roll three portions into long ropes and braid together, then place into a greased loaf pan or greased cookie sheet. Repeat with remaining dough. Sprinkle half of crumb topping mixture on each challah, then cover with a towel and let rise for 30-60 minutes in a draft-free place. Bake challahs for 35 minutes or until golden brown and bottom is hollow when tapped. Remove from pans and allow to cool on a wire rack. Prepare glaze by mixing ingredients together until well blended. Let cool completely. Drizzle with glaze.